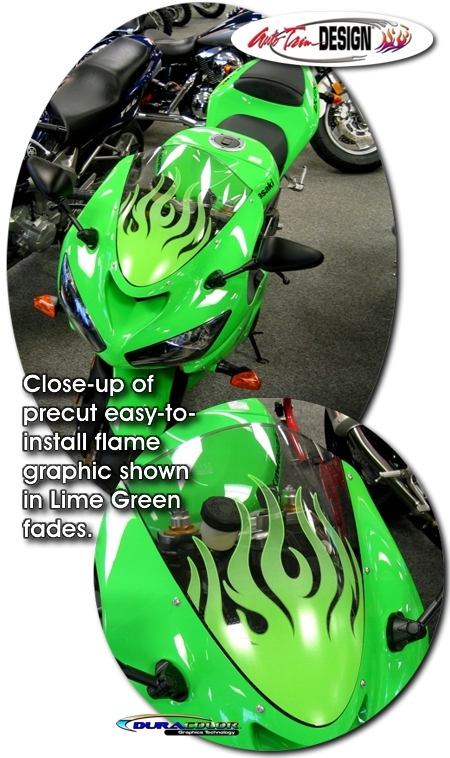 Make you bike "HOT" with this awesome Windshield Flames Graphic kit. Available in twelve (12) different colors, this graphic uniquely fades from solid at the bottom to a light fade at the tips of the flames. This graphic is precut and easy to apply - no trimming required! As an extra step, graphic is over-laminated with a 2.5 mil clear laminate which will protect it from miles of abuse. Graphic kit is made specifically for the Kawasaki Ninja ZX-6R factory windshield in the bike years as noted below. It is made to apply to the outside of the windshield and includes easy-to-follow general online instructions. Set you bike apart from the rest today!